February 09, 2014 (Information Clearing House) – What is it about America’s women diplomats? They seem so hard and cloned – bereft of any humanity or intelligence. Presumably, these women are supposed to represent social advance for the female gender. But, far from displaying female independence, they are just a pathetic copy of the worst traits in American male politicians – aggressive, arrogant and completely arrant in their views. Take Victoria Nuland – the US Assistant Secretary of State – who was caught using obscene language in a phone call about the European Union and the political affairs of Ukraine. 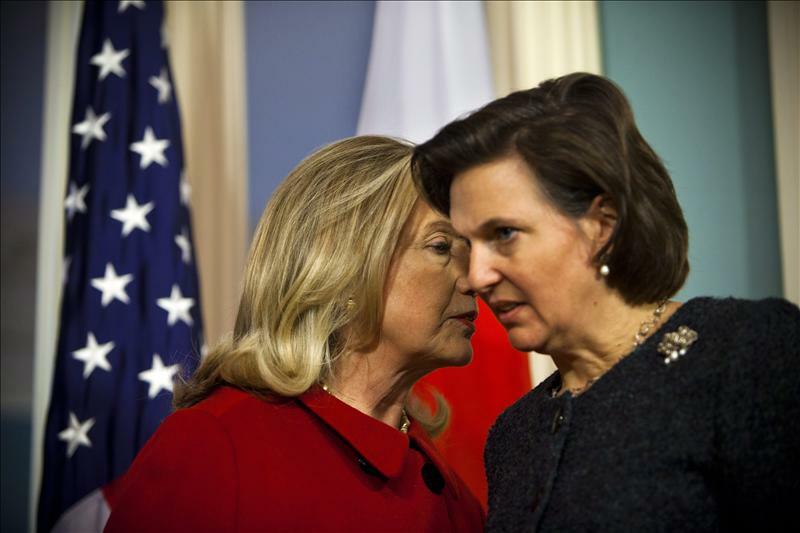 In her previous posting as a spokeswoman for the US State Department, Nuland had the demeanor of a robotic matron with a swivel eye. Now in her new role of covertly rallying anti-government protesters in Ukraine, Nuland has emerged to sound like a bubblegum-chewing Mafia doll. In her leaked private conversation with the US ambassador to Kiev, the American female diplomat is heard laying down in imperious tones how a new government in Ukraine should be constituted. Nuland talks about “gluing together” a sovereign country as if it is a mere plaything, and she stipulates which members of the US-backed street rabble in Kiev should or should not be included in any Washington-approved new government in the former Soviet republic. We don’t know who actually tapped and leaked Nuland’s private call to the US ambassador in Kiev, Geoffrey Pyatt. It could have been the Ukrainian or Russian secret services, but, regardless, it was an inspired move to reveal it. For the disclosure, which has been posted on the internet, lays bare the subversive meddling agenda of Washington in Ukrainian internal affairs. Up to now, the Americans have been piously pretending that their involvement is one of a bystander supporting democracy from afar. What we are witnessing here is the real, ugly face of American government and its uncouth contempt for international law and norms. Next up is Wendy Sherman, the Under Secretary for Political Affairs, who is also Washington’s top negotiator in the P5+1 nuclear talks with Iran. Sherman is another flinty-eyed female specimen of the American political class, who, like Nuland, seems to have a block of ice for a heart and a frozen Popsicle for a brain. Again, like Nuland, Sherman aims to excel in her political career by sounding even more macho, morose and moronic than her male American peers. Last week, Sherman was giving testimony before the US Senate foreign affairs committee on the upcoming negotiations with Iran over the interim nuclear agreement. The panel was chaired by the warmongering Democrat Senator Robert Menendez, who wants to immediately ramp up more sanctions on Iran, as well as back the Israeli regime in any preemptive military strike on the Islamic Republic. Sherman’s performance was a craven display of someone who has been brainwashed to mouth a mantra of falsehoods with no apparent ability to think for herself. It’s scary that such people comprise the government of the most nuclear-armed-and-dangerous state in the world. Programmed Sherman accused Iran of harboring ambitions to build nuclear weapons. “We share the same goal [as the warmonger Menendez] to prevent Iran from obtaining a nuclear weapon.” And she went on to repeat threadbare, risible allegations that Iran is supporting international terrorism. That is a disturbing indication of the low level of political intelligence possessed by the US chief negotiator. “Iran also continues to arm and train militants in Lebanon, Gaza, Iraq, Afghanistan, Yemen, and Bahrain. And Iran and Lebanese Hezbollah continue,” asserted Sherman without citing an iota of proof and instead relying on a stale-old propaganda narrative. Remember that Sherman and her State Department boss John Kerry are considered “soft on Iran” by the likes of Menendez, John McCain, Lyndsey Graham, Mark Kirk, and the other political psychopaths in Washington. So, we can tell from Sherman’s callous words and mean-minded logic that the scope for genuine rapprochement between the US and Iran is extremely limited. In the goldfish-bowl environment of Washington politics, perhaps such female officials are to be even more feared. The uniform monopoly of America’s political class is dictated by militarism – weapons manufacturers, oil companies and Zionist lobbyists. The only way to “succeed” in this cesspool is to be even more aggressive and imperialist than your peers. Nuland and Sherman illustrate the cold-hearted logic at work in American robotic politics: it’s a system programmed for imperialism and war, and it doesn’t matter whether the officials are Democrat, Republic, male or female. They are all clones of a war criminal state.